To avoid encountering the name Goldwater, you’d have to pay little attention to nature photography or Hopi culture–no reading Arizona Highways or visiting the Kachina doll collection at the Heard Museum. You would have to avoid flying in or out of Sky Harbor International Airport’s Terminal 4. You would have to eschew studying the state’s history or politics. You couldn’t even follow the news, since the Goldwater Institute continues to fight for conservative principles in the state. But the Goldwater whose name pervades the state–U.S. Senator, 1964 presidential candidate, and conservative icon, Barry M. Goldwater–would not have existed without another Goldwater, his uncle: Morris Goldwater. In fact, Morris Goldwater’s constitutional and familial legacy has probably had a larger impact on Arizona’s politics than that of any adult living in the state at its founding in 1912, with the possible exception of Governor George Hunt. But where Hunt left a legacy of partisanship, Morris and Barry’s relationship exemplifies a cross-partisan civility that has become rare. Morris Goldwater was born in London, England on January 6, 1852, the son of Polish Jews who would soon immigrate to the United States. He arrived in San Francisco in 1854, spent some time at a Catholic school in Los Angeles, and was trained for the family mercantile business. But, like Barry after him, Morris prized the open wilderness over the bustling city. Morris first arrived in Arizona in 1867, eventually settling in Prescott, where he opened M. Goldwater & Bros., a mercantile store, and became a major player in the economic and political life of Prescott and the state. He helped bring the railroad to his town and joined with partners to launch a bank, becoming its vice president. He was only 27 when first elected to serve as mayor of the territorial seat in 1879. In 1910, Morris won election to the state Constitutional Convention, where he served as Vice President and became the linchpin of the Democratic caucus. He led a group known as the Goldwater Democrats: a handful of moderate convention delegates that voted as a block, carrying the balance of power between progressives and conservatives. Equally significant was the political legacy Morris passed on to his nephew, Barry Morris Goldwater. Barry spoke of Morris as a man who exemplified conservative values and who ranked second only to Thomas Jefferson in the pantheon of Barry’s political heroes. To Barry, Morris was an exemplar of pioneer spirit, entrepreneurialism, and love for Arizona. In 1964, when Prescott celebrated its hundredth anniversary and Barry Goldwater was running for president, Barry nominated his uncle as “Man of the Century,” a title Morris won. 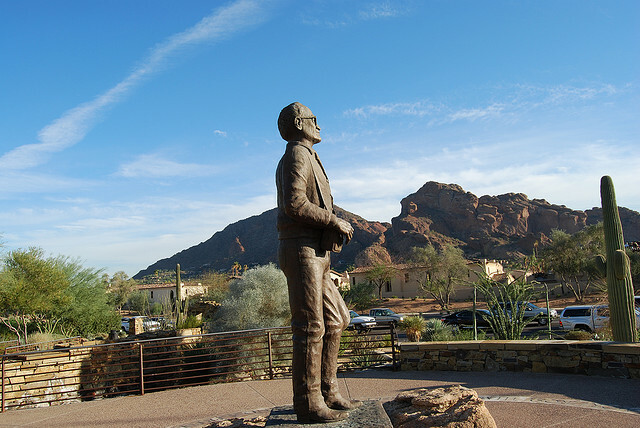 It was that legacy from Morris–of public service, party loyalty, and conservative values–that Barry Goldwater carried with him into the political arena when he entered his first elected office as a city council member in Phoenix in 1949. The next year he managed the campaign of Arizona’s first Republican governor in 30 years. Then in 1952 Barry Goldwater defied the odds by winning a seat of his own in the U.S. Senate. Of course, Barry’s party was not Morris’s party, but then neither was the Democratic Party of the 1950s the one Morris had built at the turn of the century. And so one of the lessons Morris left to Barry–a lesson that partisans of all stripes are too quick to forget–is that party isn’t everything. Though a loyal Republican, Goldwater was also a friend of Democrats. Morris had been a father of the Arizona Democratic Party; his nephew Barry became a father of the Arizona Republican Party. Their relationship is a potent reminder that the partisan divide does not separate good Americans from bad Americans–or even the good from the best.